A prestigious Gold and ‘Best in Show’ award has gone to Wyevale Garden Centres for their ‘Romance in the Ruins‘ garden designed by Claudia de Yong at the 2017 BBC Gardeners’ World Live. The design, a scented courtyard garden featuring two tumble-down turrets in the style of an old fairy tale castle, attracted a lot of attention during the show. The design featured a water cascade falling prettily into a small pond from the back turret with a rose covered pergola taking centre stage. Visitors were encouraged to wander through the garden or to sit quietly on one of the two wrought iron benches and enjoy the peaceful space. 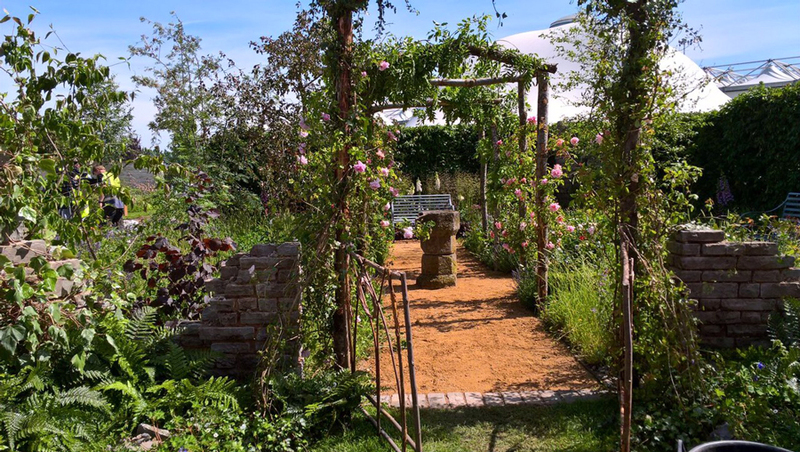 Claudia was thrilled with the result and the judges were so “blown away” by the garden: “A huge amount of hard work has gone into this garden over the last few weeks and months from its conception to realization,” she said. “My vision was to create a really poetic garden that transports visitors to another place, inspired by fairy tale castles as well as real English ruins. Using a mixture of wild flowers and traditional flowers together has helped to evoke the gentle romance of English ruins,” Claudia added. Water in the garden is one of Claudia’s key specialities and her water features have included garden ponds, lakes, streams and natural wildlife ponds. She is an award-winning garden designer and consultant offering a specialist planting service and works across the South West and East of England. Her planting ranges from a traditional, formal approach to a natural style depending on whichever most suits the client’s garden and setting.